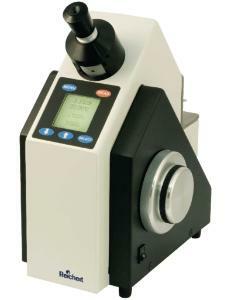 Measurement values are provided on an LCD screen along with temperature, date, and time. The wide refractitve index range makes the instrument suitable for use in food and beverage, chemical, and pharmaceutical market applications. The instrument's software features automatic temperature equilibration detection for accurate, repeatable measurements, as well as the memory capacity to hold an additional 14 custom measurement scales. Readouts are available in English, German, Spanish, or French. Sample illlumination is provided by internal long-life LEDs, and each unit is equipped with two RS-232-C serial communication ports. Ordering information: Supplied with manufacturer's two-year warranty.